In the tradition of Mermaid Avenue, Nora Guthrie invited German award winning singer/songwriter Hans-Eckardt Wenzel to visit the Woody Guthrie Archives and put music to previously unpublished Woody Guthrie lyrics. The astounding result was Ticky Tock: Wenzel Sings Woody Guthrie. A great collection of 14 Woody Guthrie lyrics sung in a way that will blow your mind. In Nora Guthrie's liner notes, she states, "Ticky Tock yanks our eyes away from the old caricature and points us to a fresh oasis, inspiring a new curiosity. Woody, and his songs, are lifted up out of the dusty pages and thrown back out into the street where they belong because my father's songs are always street songs and street people's words. It's truly amazing for me now to watch these two new friends, Wenzel and Woody, rambling together along streets of Germany. I am grateful that they have let me tag along so I can listen in on what they have to say to each other." Wenzel recorded the album in both German and English, and he premiered two songs from the album at the Nashville Sings Woody Guthrie concert at the Ryman Auditorium as part of a celebration of Woody's 90th Anniversary. Wenzel's Ticky Tock project is a compelling example of Woody Guthrie's songs transcending time and space. Wenzel brings inventive musical arrangements with musical touchstones that leap from Kurt Weill to Tom Waits to Bragg/Wilco, and a charmingly playful, engaging presence to his performances of the songs in English and German, and is able to shed new light on Guthrie's powerful lyrics. infectious techno-pop ride he called "Ticky Tock." 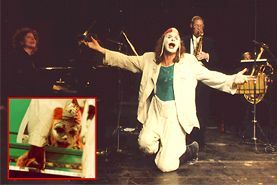 Wenzel, sometimes loud, sometimes tender, sometimes vicious and bitter, wanders between klezmer and classic, between poetry and nonsense, between worldview and high spirits, at once the clown between a hangover and a nervous breakdown." "Clown Between Hangover and Nervous Breakdown"
"Wenzel's music is demanding & malicious, dry cynical, often melancholy, always direct and consequential. 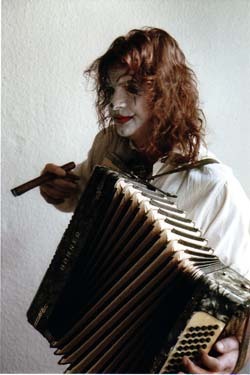 Just like him, Klezmer, Jazz, Rock, Classic, Folk and even Punk elements can be found in his music." "Time of Lunatics and Idiots"
A few years ago, having read through much of my father's unpublished song lyrics, I decided I wasn't altogether comfortable with the Woody Guthrie icon image being projected all around. I wasn't comfortable because a lot of it wasn't true. I couldn't blame anyone. It's just the way history falls in, or out, of public knowledge. So, in an effort to try to begin setting the record straight, I started looking around for musicians who knew they didn't know a lot about Woody Guthrie, not musicians who thought they did know a lot about Woody Guthrie. It's always easier to begin to go somewhere from nowhere, rather than go all the way back from somewhere and start all over again! To get to know Woody Guthrie, you only have to get to know his songs. All of his thoughts and feelings about everything are in his lyrics. There's about 3000 in all. So that's where I usually begin, and end up. Last year, I invited Wenzel to come to the Woody Guthrie Archives in NYC. He poured over hundreds of unpublished lyrics which was an amazing and exhausting feat in itself. Woody's lyrics are often layered with meanings and history, particular to a time, place or person. Dialects, idioms, slang, words unique to geographic areas, jobs and ethnic groups abound! Even Guthrie-ites can find the language challenging! I noticed Wenzel had a particular talent for sniffing out lyrics filled with political humor and double-entendre. Many of the lyrics he liked seemed to be geared for children but underneath, were equally poignant for adults. Other lyrics he was drawn to were tougher and more assertive than many of Woody's more well known songs. And a few were downright.... odd! However, the whole point is to let others draw their own conclusions. I like to let them tell me what kind of a man they find, what thoughts they find, what feelings they find. And I let them tell me, through their choice of lyrics and their music, what meaning Woody's words might still have for us now. Good words have a lot of meaning. Great words have deep meaning. A composer recognizes himself in either of these and joins up with them to complete the portrait. Wenzel's singing style and compositions speak in a distinctly "non American" voice, using instruments and melodies that most American musicians would not naturally connect to Woody Guthrie; a brass section complete with tuba, bottles, bass and piano.These are hardly the sounds of the American west, let alone the lone, acoustic tone of the "dust bowl balladeer," as my father is fondly nicknamed back home. Ticky Tock yanks our eyes away from the old characature and points us to a fresh oasis, inspiring a new curiosity. Woody, and his songs, are lifted up out of the dusty pages and thrown back out onto the streets where they belong because my father's songs are always street songs and street people's words. It's truly amazing for me now to watch these two new friends, Wenzel and Woody, rambling together along streets of Germany. I am grateful that they have let me tag along so I can listen in on what they have to say to each other. As part of her work directing the Woody Guthrie Foundation and Archives, Nora Guthrie, Woody's daughter has been working with various musicians in finding musical settings for the thousands of unknown and unpublished lyrics that she has found in the archives. German singer and composer Hans-Eckardt Wenzel was an inspired choice as someone to work with Woody's lyrics. This is an extraordinary album whose songs open new windows into the depth of Woody's writings and the musical possibilities they present. Imagine Woody Guthrie meets Bertolt Brecht and Kurt Weill with some of the modern musical sensibilities of Tom Waits and the Klezmatics. There are dates attached to some of these songs and they range from 1935, when Woody was still in Pampa, Texas to 1953, when he was deeply in the grip of Huntington's disease. It's fascinating to see, in the earliest song, "If I Was Everything on Earth," that Woody's class-conscious political analysis was already in place. That class-consciousness informs several of the songs that Wenzel has set to music including "I Don't Feel at Home on the Bowery No More," an urban variation on what Woody was singing about in his classic, "I Ain't Got No Home," and "Jinga Linnng," a 1953 stream-of-consciousness piece that Wenzel gives a klezmer setting. A couple of songs are Woody's rewrites of older folk songs. He wrote "Blue Eyes" which keeps the chorus from "I'm Thinking Tonight of My Blue Eyes," from the point of view of a sailor fighting World War II and longing for his love at home, while "Ashes to Ashes, Dust to Dust," is based on "Hesitation Blues." There are also several kids' songs including the hilarious "But I Like to Stay Home with Daddy." One of the most moving songs is "Ninety Mile Wind," about New York City that Woody wrote in 1944, but whose lyrics seems like a metaphor for the events of 9/11. Born in 1955 in Wittenberg (Germany), Hans-Eckardt Wenzel attended the Humboldt University in Berlin to study Cultural Science and Esthetics. Since 1981 he has toured as a musician, author, actor, and director in Berlin. He began touring with a band in 1999.